The Maitland Conservation Foundation administers the John Hindmarsh Environmental Trust Fund. 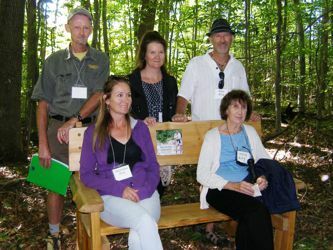 The Trust Fund was created in 1996 to honour John’s contributions to environmental conservation and to continue the projects that were so special to him. John reforested marginal lands, implemented soil and water conservation techniques on his farm and was instrumental in the preservation of Naftel’s Creek and the Saratoga Swamp. He believed strongly in teaching others about the importance of our natural environment. Over the past 20 years the Trust Fund has built on John’s legacy by supporting a variety of conservation initiatives, often focusing on projects with strong community education components. All donations to the JHETF are invested. Only the revenue from those investments is used for projects each year. The Trust Fund principle continues to grow. The Maitland Conservation Foundation, that administers the JHETF, is a registered charity and donations are tax deductible with your receipt. Annual Plant Sale and Spring Hike – Sunday May 7 in the Knights of Columbus Community Hall parking lot in Goderich. This event is being held in partnership with the Maitland Trail Association. The Plant Sale runs from 10:00 am to 3:00 pm and features sun-loving and shade tolerant perennials and a limited amount of great compost. A spring walk through the Maitland Woods starts at 1:00 pm. Watershed Monitoring – the Trust Fund supports Maitland Conservation water sampling work that helps to identify water quality trends and issues. Hindmarsh Farm – maintenance of meadow project. 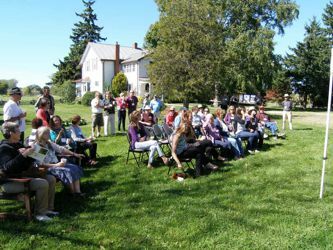 Ash Tree Replacement – planting of a variety of native trees and shrubs in Conservation Areas to replace ash trees damaged by the Emerald Ash Borer. Wawanosh Valley Conservation Area – construction of an accessible privy at the site. Donations to the John Hindmarsh Environmental Trust Fund may be made on-line through CanadaHelps. Visit https://www.canadahelps.org/en/charities/maitland-conservation-foundation/ to direct your donation to the Trust Fund. If you would like to donate by cheque please make it out to the Maitland Conservation Foundation and include JHETF in the memo line. For more information about the Trust Fund please contact Phil Beard, pbeard@mvca.on.ca or Lori Gordon, foundation@mvca.on.ca or call 519-335-3557.